Leah Michalove is a senior in the university’s Emory College of Arts and Sciences where she is a Dean’s Achievement Scholar majoring in Middle Eastern and South Asian Studies, with a minor in anthropology. 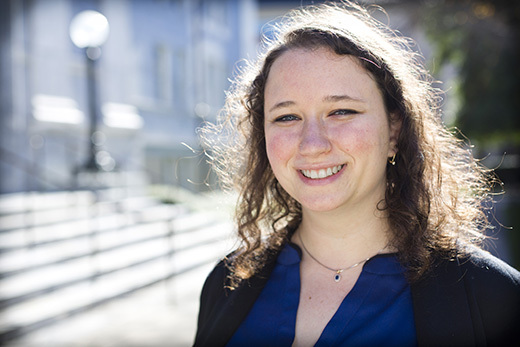 Emory University student Leah Michalove is one of 32 American college students selected as a 2016 Rhodes Scholar. A native of Sandy Springs, Georgia, Michalove is the 19th student from Emory to be selected for the prestigious scholarship, which provides for two or three years of study at the University of Oxford in England. “I’m so excited and grateful. I wouldn’t have gotten here without the support of friends, family and Emory. It’s going to give me an amazing opportunity to study at Oxford and build relationships with outstanding students from U.S. and around the world,” Michalove says. Michalove is a senior in the university’s Emory College of Arts and Sciences where she is a Dean’s Achievement Scholar majoring in Middle Eastern and South Asian Studies, with a minor in anthropology. She is a member of Phi Beta Kappa honor society and a recipient of the Amy Johnson Study Abroad Award. "Leah Michalove is the kind of student who not only seizes every opportunity for learning but also leads in every endeavor that engages her energy and talents,” says Emory President Jim Wagner. “So in that sense she represents the finest Emory students and will make a splendid ambassador for the United States and for Emory at the University of Oxford. We are thrilled at her success." She is highly involved in the theater community at Emory, and has served as artistic director, production manager and stage manager for Dooley’s Players, and as technical theater staff for AdHoc Productions. She is currently treasurer and outgoing president of Emory J Street U, which she helped to found. She also is an active member of the Emory Scholars Program. "Leah represents the very best of the university as well as the ideal of a liberal arts education. A brilliant student with broad intellectual interests, she continually finds ways to integrate her scholarly interests into her community work - both on campus and off. We are all very proud of her, and I look forward to watching all of the exciting work she will do in the years ahead," says Robin Forman, dean of Emory College of Arts and Sciences. In addition to her involvement with theater, Michalove has significant tutoring and teaching experience. She serves as an Arabic Language Tutor with EPASS tutoring, organizes the monthly Arabic Round Table, volunteered as a classroom assistant in a Peruvian pre-school, and has worked as a Hebrew tutor. Michalove has focused her undergraduate research on the Middle East with an emphasis on women. “My research at Emory was on fashion and political identity in the Middle East. I examined how modern Moroccan women express their identities though fashion and appearance," says Michalove. After completing the master’s degree in social anthropology at Oxford, Michalove intends to pursue a doctorate in anthropology, focusing on the Middle East.